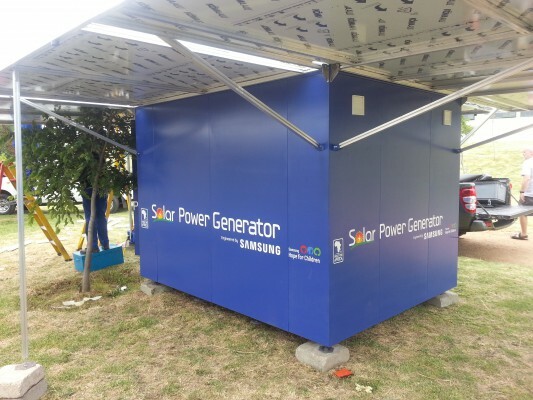 On 13 March 2013, Samsung Electronics Africa launched its Solar-Powered Health Centre model in Cape Town, marking the start of a large-scale medical initiative on the continent. The mobile centres are built for use in remote rural areas, and are intended to eliminate the economic and geographic barriers that prevent people across Africa from obtaining quality medical treatment. The Solar-Powered Health Centre is designed to reach as many people as possible, as regularly as possible. Mounted on a truck and manned by qualified medical professionals, the centres will move from one area to the next – providing a range of eye, ear, blood and dental medical services to the public. 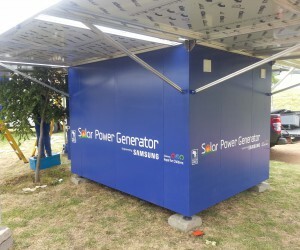 Samsung has set itself a goal to reach one million people through its Solar-Powered Health Centres by 2015, as part of its broader corporate social responsibility (CSR) goal to positively impact the lives of five million people in Africa by 2015. According to the World Bank, more than 60% of people in sub-Saharan Africa live in rural areas. These people often lack the time and resources to reach clinics for proactive medical care, and particularly if they are ill and unable to make long journeys. In South Africa, only approximately 20% of the population is served by private medical schemes, with the public health sector struggling to cater to the remaining 80% of the population. A large focus will be placed on screening people to establish conditions such as diabetes, high blood pressure, tooth decay and cataracts. The centres will also focus on educating communities about health issues and encouraging people to take tests as preventative measure. Medical products will be provided by Samsung’s partners on this project, including the department of health and pharmaceutical companies. Other partners will include medical universities, and organisations involved in healthcare such as World Vision, and Doctors without Borders. Samsung Africa’s broader CSR strategy involves a sustained focus on three key areas: education, healthcare and rural connectivity – in line with the company’s global ‘Hope for Children’ initiative. In addition, Samsung Africa focuses on developing products that are built specifically for African conditions in an effort to improve lives, as seen in its ‘Built for Africa’ product range. To ensure it is able to continue to meet consumer demand on the continent, Samsung’s education programmes – which include the Samsung Electronics Engineering Academy, Samsung Solar-Powered Internet Schools, Samsung Solar Power Generator, and Samsung eLearning Centres – are geared at supporting the development of African thought leadership and the advancement of electronics engineering on the continent.